Issues brought forward by a customer are solved through the Help Desk, where the customers’ problems are directed to the relative department of the business. According to the nature of the problem, the ticket management system sorts customer issues. Here are some answers to the questions regarding Help Desks. To what purpose do Help Desks serve? These ensure customer issues are solved as soon as possible, where top priority problems are separated for immediate attention. According to the nature of the problems, automatic assigning of relevant resources can be done. These are a type of software which respond to customer needs. Some feature of these software is registration, ticket management, tutorial builders, etc. Benefits of using Help Desk? Help Desks benefit a business as it has features such as automation of customer services, minimizes problem resolution time, better management of assets, tracking productivity, tracking issues put forward, etc. Help Desk allows a business to automate its responses to issues brought by customers. Once a query is put forward, instead of individual communication by an employee with the customer, these queries can be forwarded to a queue in the Help Desk. These systems save time and improve efficiency improving chances of customer satisfaction. With step-by-step guidance methods, customers can solve their less complicated issues without the involvement of an agent, whom can be used for more complex problems. Also, records of how the issues were handled can be conveniently stored for evaluation for improvement. 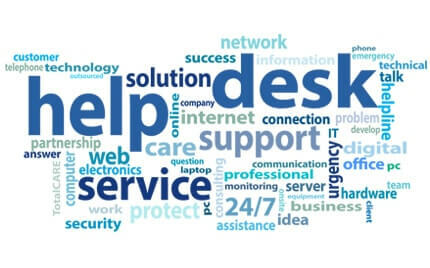 How Help Desks are optimized by software tools? These software automate correspondence with the customer, where issue reporting and resource optimization are key. Categorizing the customer needs and reacting accordingly with the aim of quick problem solving is critical. In the case of complex problems, these software need to be able to bring issues into contact of an agent or technical staff, to better achieve customer satisfaction. Also, the staff in the business can monitor how well their systems are operating through customer feedback’s. How should Help Desk initiate in a business? The implementation and initiation must come from the top management, though many parties must get involved to properly establish this system. Parties such as managers, sellers, and customers need to work together if the system is expected to work properly. Clear cut communication between the seller and customer are needed as the seller needs to know how to address the customer needs by utilizing the company resources. What approach should I take to establish a Help Desk system? Establishing such a system is somewhat of a complicated task, and as an initial system, establish a simple system catering to the basic needs of a customer. This must be simple enough to be easily managed by the staff, which can gradually be developed as needs increase. Also, allocate talented staff capable of handling the new system for running it. How to implement this system effectively and efficiently? Introduce and convince the advantages of using this tool by both staff and customer. Describe the benefits and how useful this tool is to the users, describe what can be expected through the new system and the efficiency it is able to establish to the business. Educate the users on how they are a part of the new system by using techniques such as demonstrations. Train and hold meetings regarding the system. During the launch, the participation of managerial level staff is important as their experience on such occasions is valuable. Lastly make sure always that ticket submission needs to be simple. What are the problems that may arise? Lack of experience and knowledge regarding the nature of the business is one issue. Especially when it comes to outsourcing customer support service agents, such gaps may build a negative image on your business and hence they must be thoroughly briefed to face such matters regarding the business. Another issue is the rate of employees quitting their jobs. With these comings and goings, employers face additional expenses and logistics problems in training new recruits for the job. Additional effort must be taken to retain employees in their job but using methods of motivation. Also providing training to employees with a wide variety of skills make them versatile assets, and should any employee shortage occur, they will act as a buffer until things settle down. How to select a Help Desk software? As you can imagine, prices and features vary with each product. Some companies allow the use of free trials of their software. You can easily signup and find out how well it suits your business. Depending on the nature and scale of your business, a free trial will let you know which software the best for you is before you commit yourself for a purchase. Also, know which type of software you would need and exactly what extent you will be using it for. Latest and future applications of Help Desk? Using machine-learning technology to improve configurations. Using reward systems to boost employee morale and productivity. Availability of self-service using artificial intelligence.